Wood Green Area Guide - What makes Wood Green so great? Where do Wood Green locals go? Nice little pub. Does a good roast and food! Great pub, loads of ales. Nice food! Cool little sheds with micro businesses. Pop up drinks and markets. Great coffee and loads of vegan cakes at Charlie's cafe! High street stores, supermarkets and a cinema all under one roof. Same day made fresh cakes especially for last minute orders. A restaurant/café/bar, venue and gallery. One of the best Turkish Restaurants in North London. Always busy, especially on weekends when you have to reserve seats to avoid standing outside. Amazing customer service, great food and a reasonable price for the standard. You should try the lamb and chicken grill. North London's best curry house and probably north London's best kept secret. It's a small restaurant and takeaway on Turnpike Lane that prepares freshly made curries! I love the amazing cocktails at this burger joint! Great place for coffee, brunch, an after-work drink or light bite to eat. Live music nights, and part gallery. A very popular and award-winning venue for the local community. Green space next to Turnpike Lane Station that has amazing basketball courts (the best in North London! ), a free outdoor gym and a children's play area. A truly authentic Greek family restaurant that is very welcoming and with amazing, generous portions. A recently opened coffee shop on Green Lanes. They do an amazing granola fruit yoghurt in a jar! Share your favourite place to go to in Wood Green. "In March 1918, self-proclaimed World's Greatest Magician Chung Ling Soo (or Bill Robinson as his parents knew him!) performed his world famous "catch a bullet with his teeth" trick at the Wood Green Empire. Sadly, it didn't work and it him square in the chest." It's really easy to get into central London on the Piccadilly line from Wood Green Station. I love going to Alexandra Park on the weekend - the views over London are second-to-none! The cuisine in Wood Green is the best in North London. As a Greek/Cypriot living in London, I have found some of the best Greek shops and restaurants in this area. My absolute favourite places are Vrisaki in Myddleton Road and Paneri on High Road. I love vibrant Green Lanes, with an array of Turkish restaurants, variety of shops and the amount of small parks in the area. It's right next to Alexandra Palace, convenient for shopping and transport, and still relatively affordable to buy a decent place to live. I love being surrounded by green spaces and large gardens. I love to be around malls where I can find everything I need. Wood Green is a multicultural neighbourhood, there are several shops from around the world and a wide variety of products. Public transport works very well. The health center is very good. It is a safe neighborhood for walking both day and night. Fruits and vegetables are fresh and quality. The people are very nice in this neighborhood. I am very happy to live in this part of the town. Wood Green provides shoppers with a choice of supermarkets including Sainsbury's, Tesco, Morrisons and not to mention M&S Food. There are great clothes shops, hairdressers and Wilkinsons for just about every household product you could ever want. You can commute to Covent Garden in 20 mins. At the same time you can walk up to Ally Pally to see the deer and feel like you are in the countryside. Keep it a secret so prices don't rocket! What do you think of Wood Green? Wood Green is a district in north London, located in the London Borough of Haringey. It is situated 6.7 miles (10.8 km) north of Charing Cross. Wood Green is a busy town with a sizeable shopping area with cinemas, bars, nightclubs, numerous restaurants and cafes and a shopping centre close to the tube station. The High Road, the main shopping spine, is part of Green Lanes and stretches from the Wood Green tube station to the next stop on the Piccadilly Line, Turnpike Lane, and is lined with shops along its route. Wood Green tube station is on Wood Green High road with Bounds Green tube station to the north of the area and Turnpike Lane tube station to the south, all are on the Piccadilly Line. 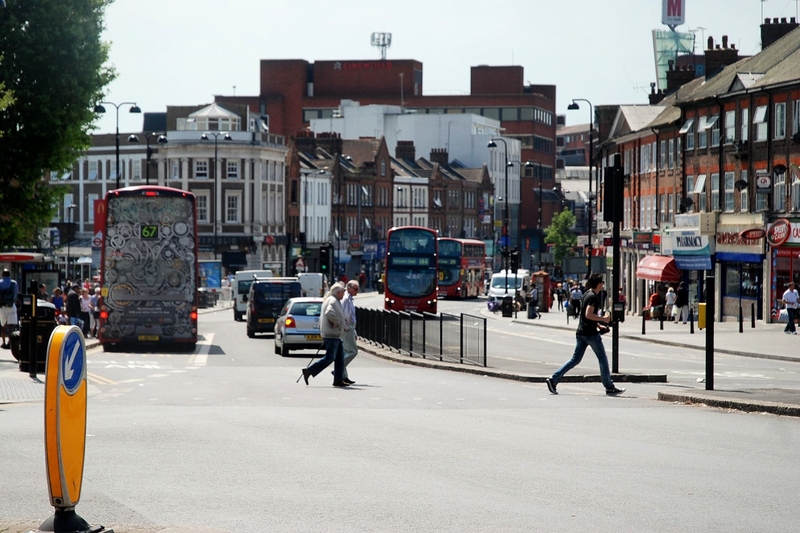 What are your favourite things about Wood Green? Find out how much your flat or house is worth om Wood Green. Feedback about living in Wood Green has been submitted directly by the public and may not neccessarily reflect the views of Foxtons. The description of Wood Green was modified from Wikipedia and is available under the Creative Commons licence. Land Registry data is Crown copyright. All the views and contributions contained within Foxtons Local Life are those of the contributors. All content is assessed before publishing for taste, however free opinion is encouraged. Foxtons accept no payment or sponsorship for content that is posted about Wood Green.